We value and promote training and education for our membership and the community as a whole. See our Community Relations page for more community related education and efforts. Public education is important because education ties into prevention and preparation for the Fire Service as well. Preparation is a must for any profession. The International Association of Black Professional Firefighters strived to prepare interested individuals for the Fire Service career. Our chapters have have had a key role in many of the high school and youth fire academy programs across the country. Below are a few programs that are helping introduce and prepare our youth for the Fire Service career. Preparation for transition from part-time or volunteer to professional Firefighting can be challenging. Below are a few link to help in this are as well. Also see our Recruitment Page for more information on employment opportunities. Continuing education is associated with any professional career. IABPFF has worked with and supported the Carl Holmes Executive Development Institute (EDI) for several years now. IABPFF also communicates classes and opportunities available at the National Fire Academy (NFA) as well. At our conferences and conventions, there will always be an education and training component included to in the itinerary that speaks to our dedication to professional development. 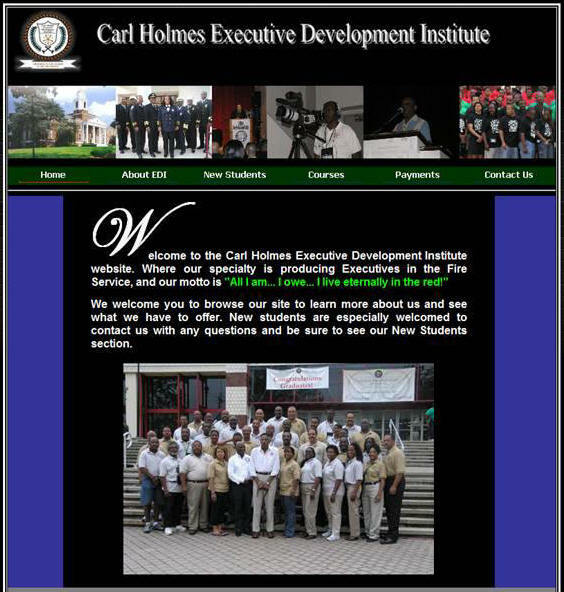 Dr. Carl Holmes established the Carl Holmes Executive Development Institute in 1991. Forty-three black professional firefighters attended the first classes, which where held at Florida Agriculture and Medical University (FAMU) in Tallahassee, Florida. Since the first class in 1991, over 1,200 IABPFF members have attended The Executive Development Institute, and hundreds of students have successfully completed program's five-year (300 hour) requirement. Also, many participants have enjoyed promotional processes to include Administrative and Fire Chief positions throughout the country and abroad. The need for diversity throughout the ranks of a department is a must; for this to take place, promotions should take place. Career advancement take initiative, hard work, and determination. The IABPFF has been and is committed to encouraging professionalism and a healthy career path. The Black Chief Officer's Committee has been instrumental in mentoring fire professionals in a upwardly Mobil direction. Read more about this committee and visit their website for more information. The Black Chief Officers Committee of the international Association of Black Professional Firefighters was formed as a conduit to pool and coordinate the resources of Black Chief Officers for the expressed purpose of improving relationships, both locally and nationally, by supporting organization's events and activities, and the IABPFF's goals and objectives through networking and written communications that improves educational awareness and enhances employment and upward mobility opportunities for Black Chief Officers and firefighters. The organization was originally established as the Chief Officer Resource Committee, under the International Association of Black Profes-sional Fire Fighters (IABPFF), in 1986, in Buf-falo, New York. Later the organization be-came known as the Black Chief Officers Com-mittee (BCOC) and the established MECCA for Black chief fire officers in America. The BCOC formally incorporated as a 501 (c) (3) in 2005. The BCOC is now a premier network repre-senting more than 500 Black chief officers in emergency response and preparedness services in the United States, Africa, United Kingdom, and the Caribbean. Our members lead the fire service with integrity and profes-sionalism. We are dedicated to innovation, excellence and creating fire-safe communi-ties. We share the common goal of all fire service professionals– returning home safely. A healthy Retirement is a goal for most people. The IABPFF believes strongly that once a fire professional reaches retirement mentoring should be a part of his or her life. In fact The motto of the Executive Development Institute, which has it's roots with the IABPFF, is " To All I Am, I Owe. I live Eternally In The Red". This mindset will help pass the torch of professionalism from one generation to the next. In 1991 the International Association of Black Professional Fire Fighters (I.A.B.P.F.F.) held its annual problem solving retreat in Washington, D. C.
One of the current problems facing the I.A.B.P.F.F. dealt with the lack of upward mobility of its membership in their local Fire Departments. Carl Holmes, a retired Deputy Fire Chief of the Oklahoma City Fire Department and now a consultant, was the facilitator of this problem-solving meeting. As many ideas were presented to solve the addressed issues, it became evident that our membership's inability to enroll in critical classes at the National Fire Academy as being one obstacle. After much discussion, the idea was offered that our organization should develop its own Executive Development Institute. Chief Holmes was to develop a plan of action to attain this goal. The board also decided that our Institute should be held each year at an African American University. The focus of course content was to be the development of future Fire Department Officers and that the course content should cover those unique conceptual, diagnostic, and human skills so overlooked in most Fire Department management-training programs. Chief Holmes was to develop the course content and select nationally known African American Fire Officials from around the country as instructors. The final design of the Institute was that the courses offered were to be of one-week duration offered in five phases. The concept proved to be a great success, with many of our participants being promoted to higher positions, too many to name. Many of our students have become Chiefs of their Departments. Florida A & M University, Dillard University, and Clark University have all hosted the Executive Development Program. Visit their website today by clicking the image below.